The second semi-final at the Mubadala World Tennis Championship was replaced by a one-set exhibition match between three-time Grand Slam winner, Andy Murray and MWTC finalist Roberto Bautista Agut as Novak Djokovic withdrew from the tournament due to injury. 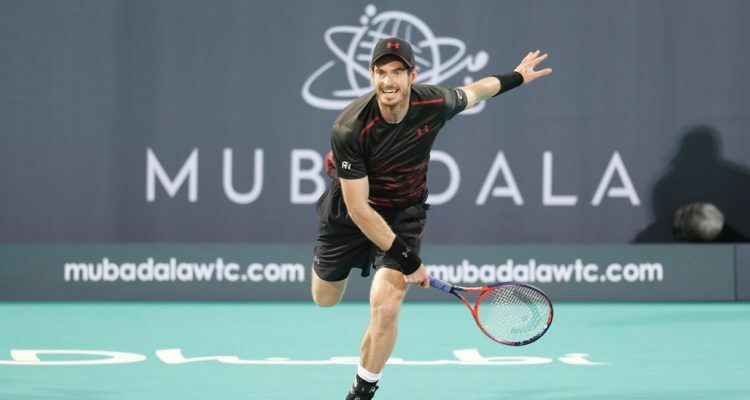 Andy Murray treated fans to surprise at the Mubadala World Tennis Championship on Friday evening, taking part in a one set exhibition match against Roberto Bautista-Agut. The 30-year-old Briton had been sidelined from the courts since the his quarterfinal loss to Sam Querrey at Wimbledon in July due to hip injury. Murray arrived in Abu Dhabi on Thursday, having a couple of practice session at the Zayed Sports City with his coach Jamie Delgado. After Novak Djokovic was forced to withdraw from the event with an elbow injury, the former World No. 1 was back in action on Centre Court. Murray, who obviously needs some more time to get back to his best but showed some fighting spirit, lost the set 2-6. “After a slow start, I started to feel a bit better towards the end but I’ll need to keep improving, for sure,” Murray told during his on-court-interview. “It was nice. I was planning on stopping here for a couple of days on the way over to Australia to get some practice in with the guys here. Murray has now flown out to Australia and is expected to play the ATP 250 event in Brisbane, which gets underway on Sunday. This entry was posted in Mubadala World Tennis Championships Abu Dhabi and tagged Abu Dhabi, Andy Murray, Mubadala World Tennis Championship, MWTC.